I’m proud to introduce a new, occasional series of blog posts about my travel writing. The series is inspired by something similar by the sociologist and author Keith Kahn-Harris. I first became aware of Keith when he was trying to crowdfund a magnificent book idea called “The Best Waterskier in Luxembourg” – an attempt to meet leading figures in extremely narrow fields. It stems from his own position as an expert in the sociology of British Jews and heavy metal, and a desire to meet similar big fish in small ponds. He aimed, in this book, to track down people like Alderney’s most powerful politician, Iceland’s finest soldiers, and Botswana’s leading heavy metal band. Sadly his crowdfund appeal didn’t succeed, though a chapter by chapter approach did lead to the publication of the first and second parts. And you can read more about the mission on Keith’s website. Quirky yet thoughtful travel projects like this appeal very strongly to my desire to see the world from unusual angles. I began reading more about Keith’s work, and following him on Twitter. 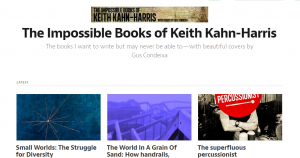 Through his Twitter account I discovered another of Keith’s ongoing projects – The Impossible Books of Keith Kahn-Harris – as he describes them, “The books I want to write but may never be able to”. The series (see right) includes some absolutely cracking ideas. His Impossible Books on sociology are rather less up my street – though the subject matters range from the sublime (the mundanity of evil) to the delightfully ridiculous (a history of inappropriate dressing). However, some of his travel-based ideas are lovely, such as “Breathe In: Travels in the Narrow Regions of Europe“. But more than any of Keith’s individual titles, what really grabbed me was the series as a whole. How brave of an author to stick all their rough ideas out there online for anyone to read. Surely the conventional approach for authors is to keep ideas under their hats until they have been more fully developed. Books are an author’s pride and joy after all, and you don’t want to reveal them as a rough first draft. You want to wait until you’ve got the final product before you proudly unveil it. I was rather captivated by what Keith was doing with his Impossible Books, and started to ask myself: why don’t I do the same myself? After all, do I not have plenty of ideas? Am I not proud of them, even (sometimes especially) the ones that have no hope of becoming reality? Aren’t I just a little curious as to what folk might think of them? And surely the mere act of writing my equivalent of an Impossible Book would also be an exercise in creative expression – could I convincingly and coherently articulate what each idea was about not just to others, but also to myself? Perhaps most importantly, we live in a social media age, where the connection between writer and reader is more intimate and direct than ever. It would therefore be honest and consistent of me to tell people what I am dreaming up next, no matter how unrealistic. For sure, revealing my ideal future book projects might be mere exercises in fun and imagination that never see publication. But if just one strikes a chord with a few potential readers, who knows what might happen…? Yes, such a move defies convention. Yes, it creates a risk of plagiarism (though if anyone is silly and rich enough to undertake any of these ideas, then I can’t really stop them). And yes there may be a tiny bit less of an element of surprise to a book that develops beyond the conceptual stage if everyone knows roughly what’s coming. But I am already revealing my ideas before they become books. I was open on my website about the mullet adventures and The Next Stop before I wrote the books, and I’m being similarly up front about my intended next book on Scotland’s island breweries. So surely it would be a healthy, creative, transparent exercise to do something similar to The Impossible Books of Keith Kahn-Harris? I certainly hope so, because that is exactly what I’m going to be doing. And hence, I’m proud and nervous in equal measure to introduce my “Books on the Horizon”: travel books I’ll probably never write, but may as well tell you about anyway. It’s an ongoing series, so I’ve no idea how many “Books on the Horizon” there’ll be. After all, with practicalities cast aside my imagination is the only real limit. This post stands as an introduction to the concept, and there’s a link in the menu above under “Books” which is a “front page” to the series. Check that page or follow the blog to see every individual “Book on the Horizon” as it is published. And please give me your feedback on each book. I’d love to know what folk think.